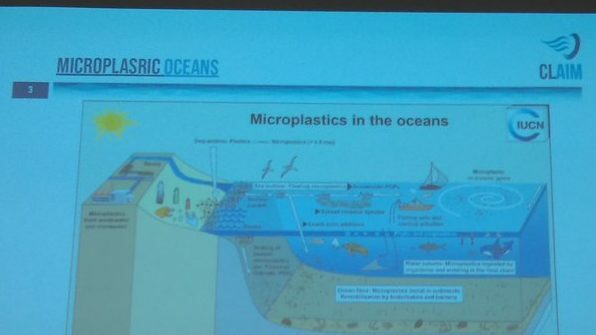 Experts working with microplastic pollution in the ocean conducted a public workshop on May 17 in Stockholm examining innovative ways to reduce marine litter and its impact. The workshop, “Microplastics Pollution: Ocean micro and macro litter pollution – problems and solutions”, took place from 9 a.m. to 12:45 p.m. at KTH Royal Institute of Technology’s Kista campus, Electrum Laboratory. The workshop program was balanced to target students, municipal and regional decision-makers, waste water treatment managers, researchers, research managers as well as a general audience, to make people aware of the state-of-the-art practices and developments in addressing this menace to public health and the environment. Experts from the Horizon 2020 European Union project CLAIM (Cleaning marine Litter by developing and Applying Innovative Methods, No. 774586) presented to participants the hazards of micro and macro litters and latest research for handling marine pollution. The workshop alsod introduce advanced electron microscopy techniques for characterizing microplastics applied by experts of the Center for Electron Microscopy of Materials at KTH Royal Institute of Technology. Only about 10 percent of plastics worldwide get recycled. The majority of plastics pollute our environment every day, says Joydeep Dutta, Professor in Functional Materials at KTH. “Microplastics are a particularly dangerous issue in plastic waste. It’s difficult to monitor the huge impacts on the ecosystems and human health, owing to their small sizes,” Dutta says. The presence and accumulation of plastic debris in the environment has seen a substantial increase with global production of plastics increasing twenty-fold in the last 50 years. Microplastics are proven to be harmful to humans and more than 180 marine species, including plankton, fish, sea birds and marine mammals. Despite being widely recognized as a major environmental problem, there is a lack of robust methods that offer essential and integrated solutions. What’s needed is forethought and technological innovation, Dutta says. Tackling plastic pollution at its source is the most effective way to reduce marine litter according to the Institute for European Environmental Policy, which underscores the need for proactive solutions that take aim at microplastic distribution and mitigation.